Independence Mine Alaska - Campgrounds near Independence Mine include some fun and unique choices. 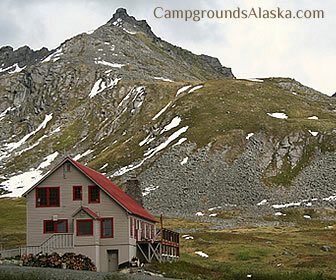 See below for a complete list of Alaska Campgrounds near Independence Mine State Park. Prepare for a whole day of great hiking in the 761 Acres that make up one of Alaska's greatest destinations, Independence Mine State Park. Located in one of Alaska's most scenic mountain passes, Independence Mine has received two thumbs up from everyone we have spoken to after they return from this park. 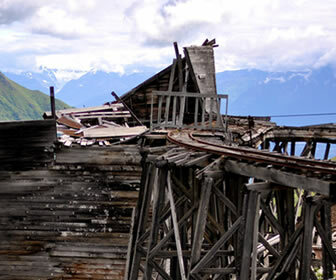 Independence Mine is a historic Alaska gold mine with loads of well preserved artifacts and a walking tour that takes you back to gold rush days in Alaska. Enter into a simulated hard rock mining tunnel and feel the experience first hand of working underground like the miners of learn what is was like to live and work in one of Alaska's largest gold mining camps. This is one of those areas where a self-guided interpretive tour is available. This tour will take you through the mine and the mining camp. A well maintained path is available as well as some hiking trails that are light to strenuous in exertion. Park Hours: Hours are 11am to 6pm, 7 days a week. There is a small, currently $5.00 day use parking fee. The visitor center at the park will be closed during the winter following the Labor Day weekend. In August blueberries can be found throughout the area.